Today AMD are releasing a new major version of the Radeon Software Crimson Edition driver suite which they've dubbed Crimson ReLive, in an effort to broaden the feature base and improve overall hardware performance. Crimson ReLive, more formally known as the Radeon Software Crimson ReLive Edition 16.12.1, includes game capture and streaming software, more comprehensive support for Radeon WattMan tools, and a new feature they're calling Radeon Chill. Previously, AMD relied on 3rd-party tools from the likes of Raptr and XSplit to offer GPU accelerated game capture and streaming. Radeon ReLive, from which this version of the Radeon Software takes it name, instead bundles these capabilities with driver software and allows you to stream directly to popular sites as well as record and upload gaming highlights. It is, in essence, AMD's version of NVIDIA ShadowPlay. Radeon Chill is a power-saving feature particularly applicable to laptops and other constrained scenarios. Described as a tool that regulates frame rates, it substantially reduces the number of frames queued before display and in theory also reduces average frame delivery time (i.e. the time taken for a fully rendered frame to be displayed). Internal testing by AMD showed reduced GPU package power consumption by ~30% alongside lower GPU temperatures. Assuming the tool has no impact on the user experience, either through perceived frame rates or additional stuttering and latency, it will be a great addition to the RSCE suite. Although Radeon ReLive and Chill are the headline features, they're not the only part of the updated drivers which AMD are boasting off. Performance continues to be a major factor, and the 16.12.1 package improves Radeon RX 480 performance by between 4 and 8% across a variety of titles. Presumably other cards which share the RX 480's Polaris architecture will see similar improvements, and notwithstanding incremental boosts AMD's pace of driver releases to address Day 1 performance concerns in the latest games has stood them in good stead. FreeSync also gets some much-needed tweaks, including better support for Borderless Fullscreen modes. Furthermore refresh rate responsiveness has been brought under control, allowing for smoother increases rather than sudden spikes to save power; potentially this could also have an impact on ghosting experienced in some instances. TressFX 4.0 is now supported at the driver level, with additional developer tools and DirectX 12 capabilities. And of course LiquidVR sees more development time, including better use of multiple GPU resources to reduce duplicated workload. 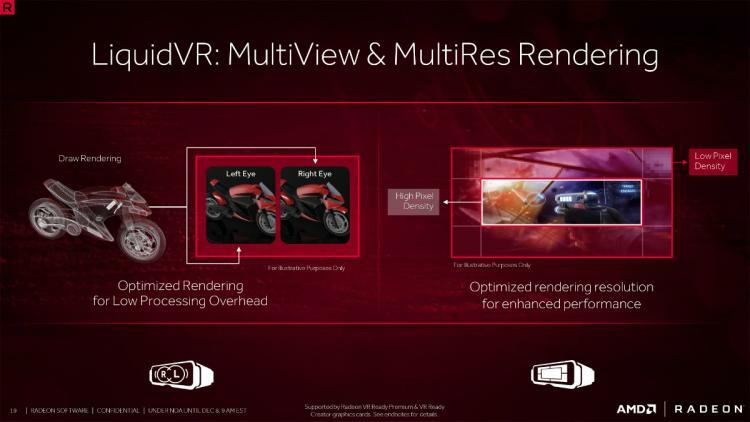 MultiView and MultiRes meanwhile optimise GPU resources for multiple views and graduated resolution rendering respectively. That's a small snapshot of the changes in the Radeon Software Crimson ReLive Edition drivers (hopefully the next release will focus on optimising that naming scheme). The full change-log can be found below, and as usual the package can be downloaded from http://support.amd.com/en-us/download. This set is intended for AMD GCN and RX 400-series GPUs operated in a Windows 7, 8/8.1 or 10 64-bit environment; 32-bit support is listed as beta and provided strictly 'as-is'. - Radeon ReLive(1): Capture, stream and share your greatest moments and gaming wins on your computer system with Radeon ReLive. Modify settings quickly, conveniently, and play seamlessly with the easily accessible in-game toolbar. Express yourself in bold new ways with custom scene layouts. Upload your latest highlights and let them be a conversation piece. It's never been easier to build and grow your online community at anytime, anywhere. 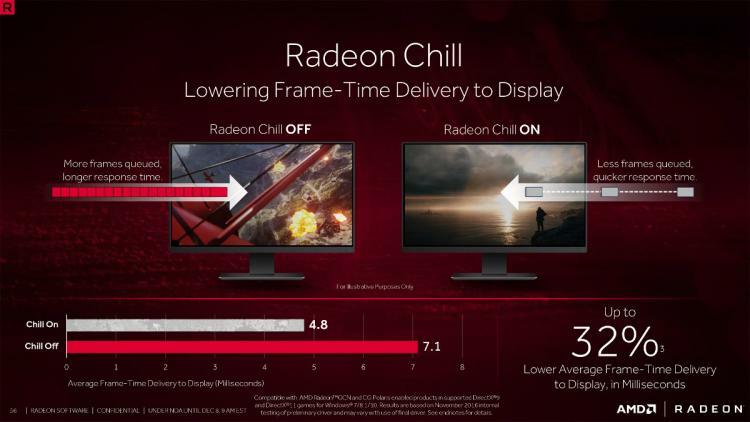 - Radeon Chill(2): A power-saving feature that dynamically regulates frame rate based on your in-game movements. Radeon Chill can improve power efficiency and can lower temperatures for supported products and games when enabled through Radeon Settings. 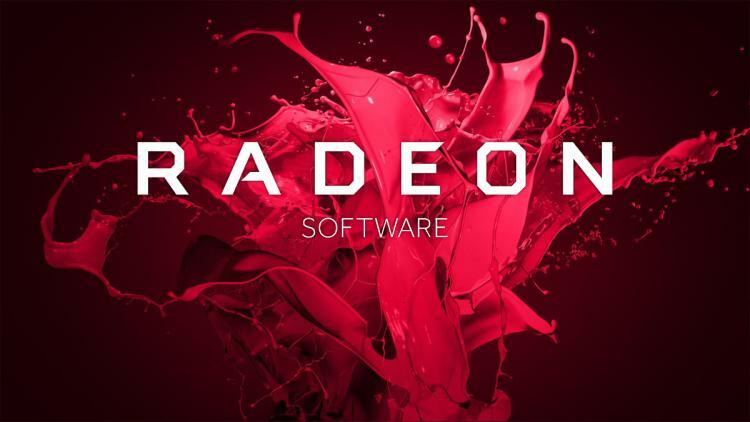 - Radeon Software Installer(4): New user interface and intuitive Radeon Software Installer that includes options for express install, custom install and clean uninstall. The new installer will also show options for the latest available driver for your system configuration during the install process. - Display Connectivity(5): New advanced display settings and diagnostics page within Radeon Settings with better detection for HDMI® cable issues and fallback for end users experiencing display issues. - AMD FreeSync™ Technology(6): Now supports Borderless Fullscreen Mode for applications and gaming with AMD FreeSync™ technology displays and supported products. Now supports Gradual Refresh Rate Ramp for mobile configurations with AMD FreeSync™ technology displays and supported products. - Upgrade Advisor(7): Provides a system requirement evaluation for Steam® games in your Radeon Settings library. - HDR Gaming Support(8): Experience the benefits of HDR gaming with Radeon Software Crimson ReLive Edition. Support for games with HDR 10 or Dolby Vision™ capabilities. - VP9 Decode Acceleration(9): 4K 60Hz GPU-Accelerated Video Streaming enabled on supported Google™ Chrome web browsers. - Skype Performance Enhancements (10): Lower CPU usage during Skype™ calls for select AMD APU Family products. - User Feedback Page: The User Feedback Page enables a direct link for end users to the Radeon Software Team and allows users to provide feedback and vote on upcoming features for Radeon Software. The User Feedback page can be found here. - Unable to launch the Problem Report Wizard from CCCSlim in Radeon Settings. - Radeon WattMan Power Limit setting may not retain after hitting apply when Auto Temperature is enabled. - DOTA™ may experience flickering in some hero and effect models when running the application in Fullscreen. - Pixel Format options may not appear in Radeon Settings on some 4K TV's with Radeon RX 480. - The Division™ may experience flicker during gameplay when using AMD Multi GPU configurations. - The Division™ may experience an application freeze or hang when running in AMD Multi GPU configurations after extended periods of play. - Game quality or performance may be degraded when launching multimedia content on a secondary display before running a game. - CIM folder retains under program files even after complete driver uninstallation. - Radeon Settings may experience an intermittent crash when accessing Radeon WattMan. - Display tab with virtual super resolution may be removed or missing in Radeon Settings. - The Radeon WattMan feature may intermittently display a Radeon Software popup error regarding Radeon WattMan for non-supported products. - Random crashes may be experienced on Mozilla Firefox. - DirectX®12 content may be unable to launch on some older CPUs that do not support popcnt instruction. - Intermittent Mouse Cursor corruption may be experienced on Radeon RX 480. - AMD FreeSync™ technology may experience performance issues with Borderless Fullscreen application support when a secondary display is attached and has dynamic content running such as video playback in a web browser or if other applications or game launchers are running on the primary screen in the background. A workaround if this issue is experienced is to minimize all other running applications that are on the primary desktop display or on non-primary extended displays. - Counter-Strike™: Global Offensive and World of Warcraft™ may experience flickering or performance issues the first time the game is launched on a system boot with AMD FreeSync™ technology enabled. Workarounds include exiting and restarting the application or task switching (alt+tab) in and out of the game to fix the issue. - AMD Multi GPU configurations may experience a system hang or reboot during install when using tiled MST 4K or 5K displays. - Titanfall™2 may experience black square corruption in game menus or during game play on some Graphics Core Next products. - FIFA 17™ may experience an application hang or black screen on launch for some select Hybrid Graphics or AMD PowerXpress mobile configurations. - The XBOX™ DVR application may cause conflicts with Radeon ReLive, users are suggested to disable XBOX™ DVR if Radeon ReLive is experiencing issues. - Radeon ReLive may fail to install on AMD APU Family products or experience a system hang or failure to record when using the recording feature on AMD APU Family products. - Radeon ReLive may experience recording issues or issues toggling the Overlay/Toolbar when Frame Rate Target Control is enabled. Users are suggested to disable Frame Rate Target Control when using Radeon ReLive. - Battlefield™1 may experience UI flickering and/or performance drops when recording gameplay with Radeon ReLive on graphics products with 4GB or less of VRAM. - DOTA™2 may experience game corruption when performing a task switch while recording with Radeon ReLive in AMD Multi GPU configurations. - Radeon ReLive recordings may experience flicker when creating a single recording for many hours. - Radeon ReLive may experience minor graphical corruption for the first few recorded frames when launching UWP applications. - In AMD Multi GPU configurations the secondary graphics product will exit BACO when Radeon ReLive is enabled. - Radeon ReLive will not allow recording settings to change with Instant Replay enabled. A workaround is to disable Instant Replay and change settings then enable Instant Replay. - Radeon ReLive Overlay/Toolbar will not launch or Record when running League of Legends™ in Administrator Mode and Windowed Borderless Fullscreen. A work around would be to not use administrator launch privileges or to use Fullscreen mode. - Mouse cursor may stutter in recorded video when there is limited on screen activity outside of minor mouse movement. - Vulkan™ applications may experience a game hang when using Radeon ReLive to record. - Radeon ReLive will not notify an end user of low disk space during recording.